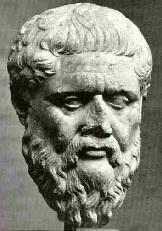 Few definite details are known of Plato's life. He was born in Athens c. 427 BC and was the youngest son of Ariston, of an old and wealthy family. It is claimed that his real name was Aristocles, with "Plato" (meaning "the broad") being a nickname given to him because of his wrestler's physique. He served in the last years of the Peloponnesian War between Athens and Sparta, and after democracy was restored in Athens in 403 BC he hoped to enter politics. However, the realities of political life as well as the execution of his mentor Socrates in 399 BC drove him to abandon this goal. After the death of Socrates, Plato left Athens and traveled in Italy, Sicily and Egypt, where he learned the function of a water clock. In Italy he came in contact with the ideas of Pythagoras, which gave him a new appreciation of mathematics. After serving again in the military, he returned to Athens in 387 BC and founded his Academy, which he presided over until his death in 347 BC and which survived for nearly a thousand years after. His works include discussions of mathematics, ethics, science and philosophy, usually in the form of dialogues. Some of the most famous are the Republic, Phaedo, and Symposium. A "defense" of the beliefs of Socrates. An discourse on the answer to the question: Is it right to disobey the State? An attempt by Plato to define virtue. Can it be taught? Detailed discussion and treatise about whether it is better to live justly or unjustly.